After a recent trip to Italy (where the coffee is AMAZING), I decided that it was time to buy a serious coffee maker that would let me make all of the “long” coffee drinks that I love. (By “long” coffee drinks, I am referring to latte, cafe con leche, and cappuccino). Here at home, those drinks require a trip to Starbucks and a $5 outlay every time. And, coffee-holic that I am, one cup is never enough! So I began to do my research and came up with a few options, the frontrunner was the Gaggia Brera. 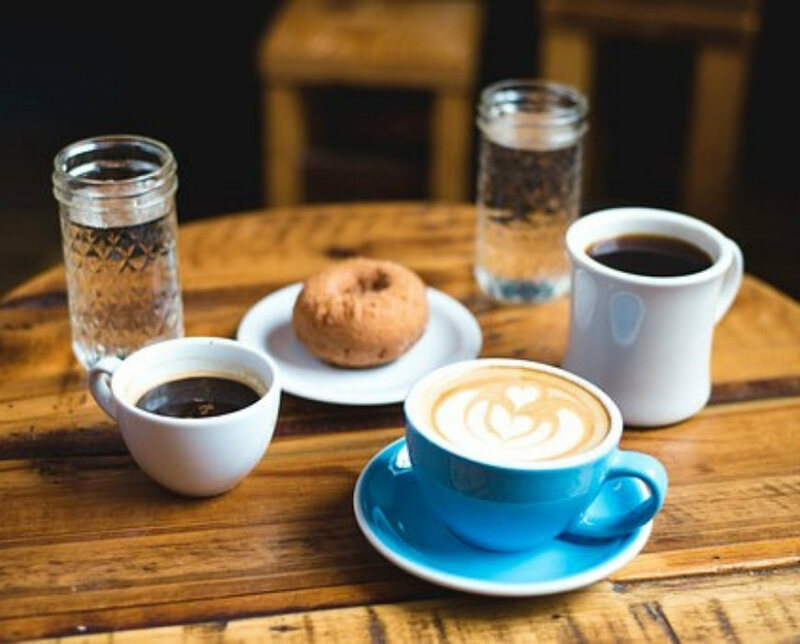 There are a lot of things to consider before buying a coffee machine. This one depends on your lifestyle, not to mention your tastes. If you prefer a shot of espresso in the morning, rather than a long coffee drink, you would be best served by a stovetop espresso maker. These are inexpensive (actually downright cheap) and take up very little room, not to mention the fact that they make the BEST espresso. Better than any machine. As well, if you only want the occasional long coffee drink, you could supplement your stovetop espresso maker with an inexpensive milk frother, which you can easily tuck into a kitchen cupboard when not in use. Do I have the countertop real estate for one? Countertop coffee machines take up space. They all have different footprints, but they are yet another appliance that will live in full sight. And even if you do choose to put yours away between uses, it will take up a fair amount of cupboard space. Full-service coffee machines can be pricey, ranging from hundreds to thousands. Will you use it enough to justify the cost? What are your favorite coffee drinks, and does the model that you are looking at make those particular drinks? The other (and I think the most important consideration of all) is how easily does the machine clean up. Some of the machines that I’ve seen have reservoirs for milk (which means tubing that carries the milk to the frother). Stale milk is, simply put, disgusting. Consider how difficult the machine is to keep clean because you will need to clean it between (almost) every use. The Gaggia Brera makes Italian espresso at the push of a button With its Pannarello wand, you can easily froth milk for lattes and cappuccino. It brews coffee from beans or ground coffee, and you can easily customize your brew with an adjustable brew strength setting. You can also control the coarseness of the coffee grind. The Brera is an attractive appliance, with stainless steel panels on the front and a compact footprint. For a mid-priced coffee machine, the Gaggia Brera has an awful lot to offer! This is a great option if you don’t have an enormous budget – high-end espresso machines can cost thousands of dollars. It is well made and despite the number of plastic parts, should last several years before any of the parts need to be replaced. Stainless Steel – This sleek machine has the look of a much more expensive machine with stainless steel front panels and drip tray. The sides and control knob, it should be noted are plastic. Easy access – everything that you need to access is on the front of the machine. This includes the dregs drawer, the water tank, and the drip tray. This allows for easy access, and (more importantly), easy cleaning! Water is loaded to the left of the spout, coffee beans are loaded on top, and waste grounds come out on the right. The removable parts make cleaning a breeze. Panarello Wand for frothing milk – The panarello wand on the front of the machine makes quick work of frothing milk for lattes and cappuccinos. The wand also dispenses hot water (very hot, indeed) for tea and cafe americano. For daily use, the steam wand only needs to be wiped with a damp cloth. For more thorough cleaning (once or twice a week if you use the machine daily), it is a bit more time consuming, as the wand comes into several pieces and is not dishwasher safe, so it needs to be washed by hand. Rapid steam technology – The water for this machine gets hot, and fast! One note is that when the machine is turned on, it self-flushes, so it isn’t a bad idea to keep a cup under the spout to catch the waste water. The Brera also boasts two separate boilers, on for brewing coffee, the other for making steam, so there is no awkward toggling between the two as with some other models. The LED illuminated display is easy to see, and the push button controls are well marked and easy to use. The controls on this unit include an adjustment for coffee grind (thanks to a 1400 watt motor), coffee strength (light, medium, and strong), and separate buttons for espresso and cafe americano. The control panel includes a cleaning notification indicator, letting you know when the machine needs to be descaled. Descaling needs to be done a couple of times a year, and requires Gaggia’s descaling solution (which is not included with the machine). 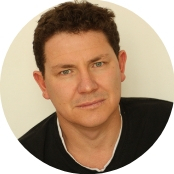 It is a hands-on operation that takes about 40 minutes of your full attention. Not a difficult task, but a time consuming one. High quality coffee beverages – This machine makes a very good shot of espresso, but really excels in making drinks with frothed milk. The panarello wand incorporates air into the steamed milk and gives it a great texture with tightly packed air bubbles. One nice feature of the Gaggia Brera is its pre-infusion brew system. Once the beans have been ground, they are tamped and pre-soaked before the brew cycle begins. This helps to extract more flavor from the beans. The Gaggia Brera is a small machine, taking up only a 15.5” by 10” patch of countertop. It’s height is 11.5” (which is well shorter than the height of most kitchen upper cabinets), and it weighs in at 19 pounds, so it is easy to move. The downside to the compactness of the Brera is that the machine accommodates cups from 3.25” to 4.5” tall. The narrowness of the drip tray does make it difficult to fit a bulky cup or mug under the spout. As well, the water tank is on the small side, only accommodating 4 to 5 espresso shots before needing to be refilled. The Gaggia Brera is energy efficient, entering standby mode after an hour of inactivity. This feature is not strictly necessary, as the machine can easily be turned off after making a cup of coffee – the quick steam feature allows coffee to be made within a couple of minutes of being turned on. The Brera also offers a four stage water filtration system, filtering the water before the brew cycle starts, offering fresher, cleaner tasting coffee. There are several semiautomatic machines in this mid-priced category. 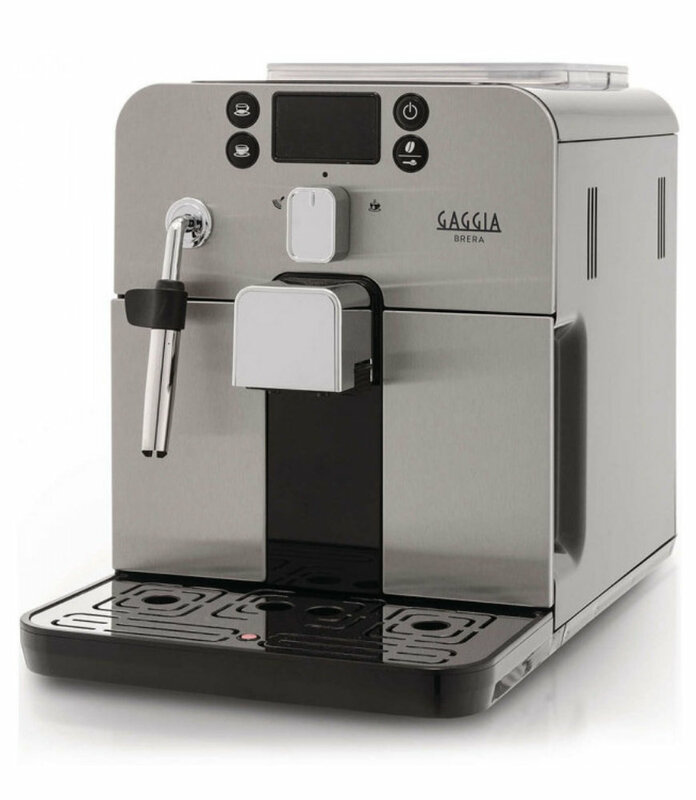 The Sage Barista Express is comparably priced to the Gaggia Brera. Known for their solid, beautifully designed kitchen appliances, Sage has made a sturdy entry into this market segment. This coffee maker boasts a 1600 watt heating system. It automatically adjusts the water temperature to ensure consistent brewing results. The bean hopper is sealed (to maintain freshness) and holds ½ lb of coffee. The conical burr grinder is made of stainless steel. In addition to the generously sized bean hopper, the water tank holds 2 litres of water, minimizing tank refills. This machine, by DeLonghi, is a bit more expensive than the Gaggia Brera. It is also a fairly small unit, boasting a 1250 watt motor, and its own water filtration system. It brews coffee with a time-release function which saturates the coffee grounds a little bit at a time to extract more flavour. DeLonghi claims that maintenance on this machine requires half the time of its competitors. Like the Gaggia, it also has an energy-saving switch. 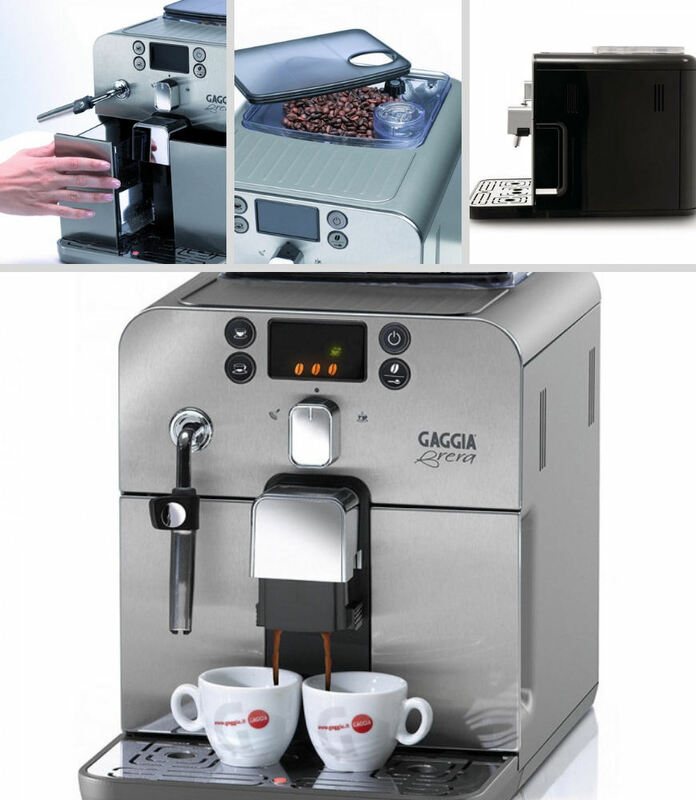 On the whole, the Gaggia Brera is a great machine for a mid-range automatic espresso maker. The design is well thought out, and the use of plastic components keeps the price down. It is easy to use, and while time consuming, the cleaning/descaling process is easy. Over time, the plastic components may need to be replaced. The only downside to this machine is that the espresso is good, but not fantastic. It makes a great base for lattes and cappuccinos, so if espresso is your go-to drink, you are better served by buying an inexpensive manual espresso maker. If long coffee drinks are your poison, then this is the machine for you!